Blog by Loree Mayer Design. Featuring Wedding and Events as well as Small business Branding. I've had the pleasure of working with Katie and Tony on just about every aspect of their wedding, starting with their engagement photos to the big day. It's so humbling to be asked to be a part of all of these special events and to help brand it all! Katie's events and stationery were all about making a statement and I think we did that! 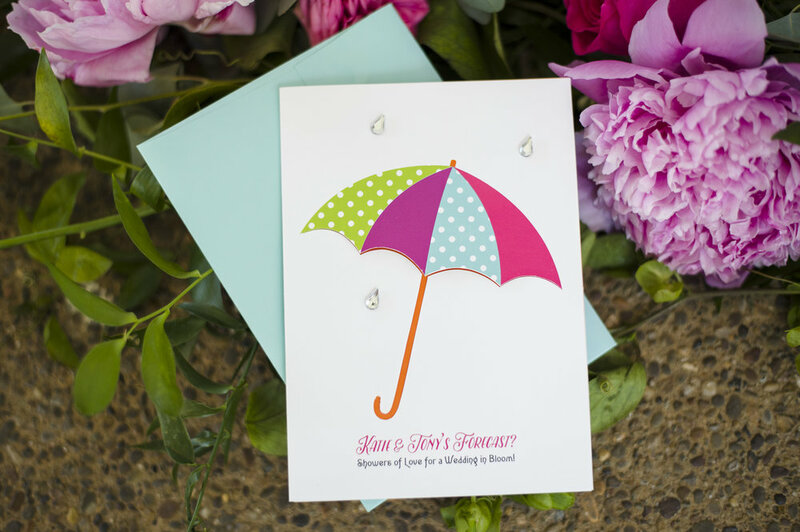 Her Wedding Shower invitation featured a pop-up inside and rhinestone rain drops on the outside with a three dimensional umbrella. The menu was die-cut in a rain drop shape to fit perfectly into her plates. Pillows were created with her monogram and florals. © 2018 Loree Mayer Design. All Rights Reserved.